The Analox 50™ is a precision instrument that provides continuous, accurate monitoring of CO2 levels to ensure a safe working environment for your employees, suppliers and yourself. 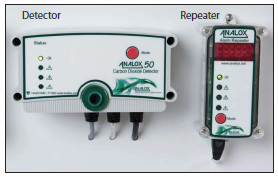 A proven system with over 80,000 units installed worldwide, the Analox CO2 Monitoring System is comprised of one detector (with visual and audible alarms) and one alarm repeater for remote mounting. Additional accessories are available, including an extension repeater, detector protector, detector splashguard and wearable protector.